St Stephen’s chapel, also known as the Royal Chapel of St Stephen, served its ecclesiastical purpose at the principal palace of Westminster, after being constructed as a two-storied structure in circa 1297 AD. Interestingly enough, it was later ‘repurposed’ as the first dedicated chamber of the House of Commons of England (and Great Britain), from the 16th century until early 19th century. But the disastrous fire of 1834 destroyed the main body of the chapel, while its lower level crypt and adjacent cloisters barely survived the catastrophe. And now, like a proverbial phoenix, the St Stephen’s chapel has risen from its ashes, albeit in the digital realm, with the commendable efforts of the art historians at the University of York. The accounts record the people responsible for a building of great magnificence, naming masons, sculptors, painters, glaziers, and armies of workmen, but also their suppliers. In the period before and after the Black Death, they offer exceptional insights into medieval crafts and working practices. They are also a direct link to the lost building. St Stephen’s was built by King Edward I to be a showcase of English royal splendor. When the Chapel was dissolved during the Reformation, it became a meeting place for politicians to debate the issues of the day. Members of Parliament had previously met in a number of different locations. Once they took occupation of St Stephen’s, however, they never left, even though there was never a grand plan for a new home for the House of Commons. The move into St Stephen’s was [thus] a by-product of the Reformation, but it had profound consequences for the future of British politics. When the Commons was gutted in the Westminster fire of 1834, a new debating chamber was constructed of strikingly similar design. Our politicians still meet there today, in a Victorian re-imagination of a medieval and Tudor building. It’s a fascinating example of continuity in British political culture. It has been a fascinating journey through time and has taken us in unexpected directions. Officials at the Palace of Westminster have really embraced the project and we have presented our findings at Parliamentary committees, where we hope our research will influence discussion on the restoration and renewal work required within the building today. 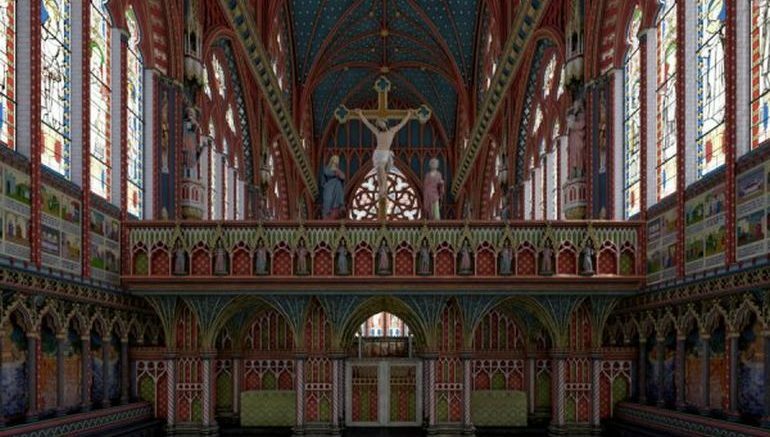 For various reconstruction angles of the medieval St Stephen’s chapel, you can take a gander at the website of Virtual St Stephens.